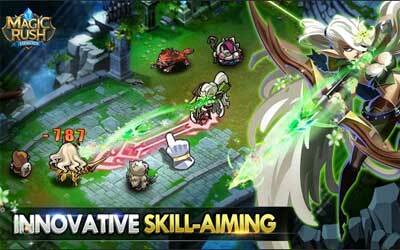 Previous version Magic Rush: Heroes 1.1.133 apk for Android will help you to downgrade or install older app easily. This is one of the best Role Playing apps. In other hand, when you win the battle, you will get the point that will be useful to lock the secret weapons and the new levels. Talking about this game, you will find the great game there. Yup, this game is special with the kinds of the features. In this case, you will see the great graphic of the game with the real sense. In other hand, you also will get the innovative skill inside the game as the improvement from the previous version. In other hand, you also can build your own kingdom and defense it with buying some guards there. Magic Rush: Heroes has the 4.4 of the average rating in plays-store that show the interesting of the people with this game. When you want to install this game in your smartphone, you need to prepare around 49MB in its file size. In other hand, you need to prepare some money to have the in-app products. Greatly increased the rewards for sending 99 and 999 flowers. Players will now get a large amount of Shadow Essence. Greatly increased the HP of high level Demon King. Slightly increased the damage penalty after entering a fatigued state in World Map battles. Raised mining amounts from 8% to 20%. This game is really fun. You have a combination of quest game and tower defence strategy game. Its like having 2 in 1 game.